The critical errand of this trip | Musings of a marginally sane feline-appreciating female. ← Tip at the buffet! We only have these in kiosks at the holidays back east. Gotta get some bordeauxs for my brother for taking care of the critters. And maybe some for me, too. Now I just have to figure out if I can put them in my carryon or if I have to find space in my suitcase. 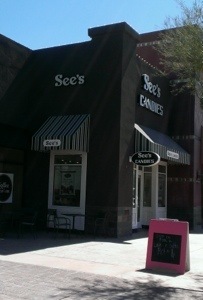 This entry was posted in Candy, PHX, See's, Travel and tagged Candy, PHX, See's, Travel. Bookmark the permalink.